Love my dresser. 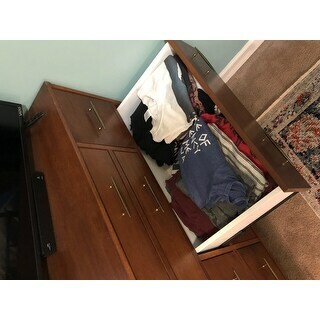 Different size drawers which are nice for many different items. Very easy to put together. Expand your clothing storage with this oak-finished dresser from Carson Carrington. The rubberwood and veneer frame has four large bottom drawers, and four smaller drawers up top for accessories. 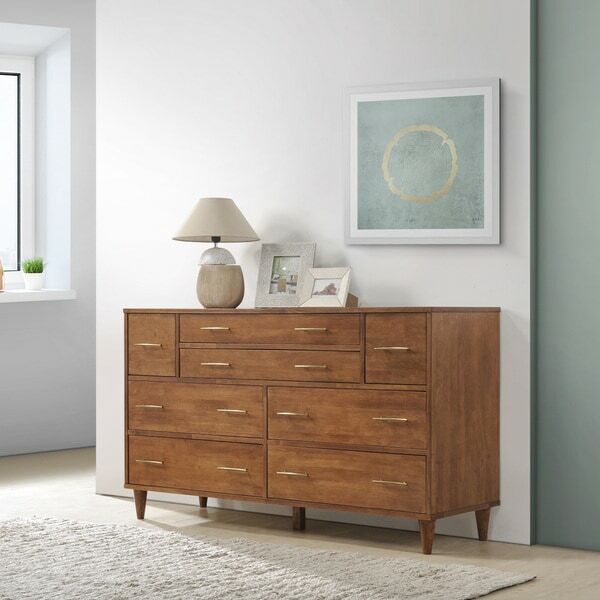 Tapered legs and thin antique-style drawer pulls give this piece a mid-century feel. I was very worried about this as it had no reviews when I bought it, but the style and color were exactly what I hoped for, so I decided to give it a chance. It is, hands down, the most solid piece of assembly-required furniture I've ever owned. It ships in three boxes, the lightest of which was 20kg, so this thing is no joke. It says to have at least two people assemble it, but I didn't really have the option, so I managed it on my own (and I'm a female...) -- it was a bit tricky balancing some things on my own, but overall it was a very straight-forward process, albeit time-consuming (took me about 6 hours). There's one little spot where the finish either built up a little or it was dinged prior to staining, but it's barely noticeable/doesn't impact my opinion of it (and was the only flaw). All of the hardware was included and worked properly/I didn't run into issues with striped screws, etc. A word of advice -- when attaching the drawer runners, DO NOT TIGHTEN THE SCREWS ALL THE WAY. The directions tell you not to 'over tighten' them, but it's not very clear -- you should make sure they have just a little bit of give so that the finished drawers sit neatly/aren't too tight along the top edge. Don't have the runners too loose, but just enough that you can still wiggle them. My only complaint about this dresser is that the bottoms of the drawers are basically a very thick cardboard (similar to the back, which is not solid wood). I would gladly have paid the extra to have more substantial bottoms, as I'm a little concerned about how well these will wear, but all in all I couldn't be happier with this purchase and would highly highly recommend! Beautiful once assembled, but takes sooo much time and effort to assemble. We were sent the wrong part for one drawer, so all together it took me and my boyfriend 6+ hours to finish the job. Some drawers aren’t perfect due to the difficulty of the job/one piece being incorrect, so it makes me so nervous anytime I open a drawer. Having said that, I love how it looks, it fits all of my clothes, and is a beautiful high quality wood. Would recommend if purchased fully assembled! Like other reviews have said this drawer comes in a ton of pieces and takes some time to assemble. I had no issues assembling on my own (needed help to just get the top piece on) but did need help moving it around. Once assembled it is very heavy, but also feels quite sturdy. I did have a problem with one drawer handle - the screw didn't catch the threads in the handle so I went out and bought a slightly longer screw which did the trick. We're using this in our nursery and it's a great height to use as a changing table and also has a lot of drawers for storage. Oh boy! This dresser was insane to put together and I loooove putting furniture together. It took me about 4.5hrs to put it together alone with only hand tools. Everything came in three fairly heavy boxes but it arrived very quickly and without and issues. The color and style works great in my bedroom since it’s a mid century style. The wood is a tad more reddish than my nightstands but it’s not so different that it looks bad. The size is great too. The drawers fit a ton of clothing and even the skinny drawers are great for undergarments. I’ll be keeping this dresser for a very long time, not only because I like it but because I spent so much time putting it together. I also ended up with a gnarly blister from using the screwdriver for hours, oops! Beautiful piece of furniture. Took a while to assemble, but worth it. Love that the inside of the drawers is white. Makes it feel very clean and sharp for your clothes or other items. Dresser looks great in person...color is a bit darker in person. Assembly is extremely tedious. Not hard...it just took forever...about 3 hours by myself. One of the holes in the drawers was screwed incorrectly so it doesn't fit. I am hoping they will send me a replacement front after I contact them. The top middle drawers are also very shallow. I wish it was one deep drawer instead of two shallow ones. It would be more practical. 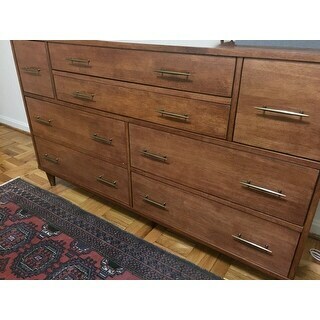 A beautiful mid-century oak dresser just like what I had imagined for my space. Could not have been happier with how it turned out. I am very happy with this purchase and would recommend this product. The drawers have a nice soft close feature. The color is true to the pictures. Looks great in my bedroom. First off, all the reviews are correct on how time consuming the assembly of this dresser is. If you don't want to go crazy, you definitely need another person to assist you with this. The instructions aren't very clear and there's a lot of pieces so it's very time consuming. I also have to mention the color is not like the picture. A lot of people said theirs was more reddish. The one I got was closer to an espresso color. 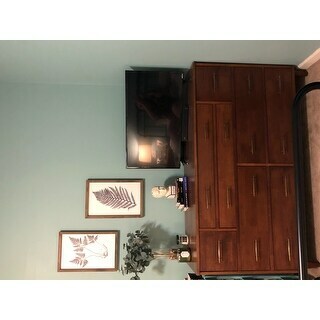 Other than the assembly and the color being off, I would give this dresser a high rating. It's very sturdy and it has plenty of storage space. For what you get, it's worth it! Phew! This guy was quite the task to put together. However, it is so dang GORGEOUS. While my Mum and I consider ourselves to be expert box furniture assemblers, this still took us a few hours. We had absolutely no issues with assembly though; all instructions were easy to understand and thorough. All parts came in their expected quantities and I just love the vintage look of this dresser. Two of the drawers do close a little too far but I'm not worried about this minor issue. It may even correct itself once weight is added to the drawers. Looks perfect in the new nursery with lots of room for all things baby! It took my boyfriend and I several hours to assemble this dresser, but the directions were pretty easy to follow. We were missing a bag of screws so we had to make a trip to the hardware store but otherwise assembly went pretty smoothly. It's a very pretty and solid dresser. It feels like it will last many years. I'm happy with our choice. Look this is a great piece and beautiful and functional. But be aware! It is by far the most complicated piece I have ever put together. Instructions not good, many pieces, many steps. You even screw in the drawer pulls, tracks- everything. And I love putting furniture together and even I needed a drink after this thing. Otherwise great piece and the only reason I knocked off a star is the amount of manual labor I put in to save a few bucks. Love it! The design, the color, the knobs, the white inside of the drawers, and the stability/quality of the wood. love this set! You can tell they will last us a long time! Super happy with this purchase! It was the easiest piece of furniture I have ever assembled. All the pieces were clearly marked. It is the nicest piece of furniture I have ever purchased that required assembly. LOVE LOVE LOVE this dresser. Looks brilliant in our room and also got the matching nightstands. It is a very solid construction and easy enough to put together. I would recommend using an electric screwdriver just to take the pressure off your hands. The color is as it is in the photo and the drawers have an easy glide closure with them so no banging. It all arrived safe and sound in Delivery. Would definitely recommend this product. This is a gorgeous piece of furniture that is sturdy and looks just as good as the photos. The only downside is that the assembly takes a long while. I had professional installation that took about 3 1/2 hours. We love this dresser, only took a couple of hours to assemble and beautiful!! This took my husband about 6 hours to assemble and he's a contractor! He did reinforce it with wood glue so that it would last better. It turned out beautiful and I absolutely love it! I adore this dresser. I love the unique drawer sizes which are great for different sized items. It is also very sturdy! The hardware is a great accent also. Beautiful dresser. Looks exactly like the picture displayed on the website. The wood color is beautiful and the quality is excellent. Feels and looks more expensive than it's true cost. I usually do not like wood bedroom furniture as it makes me feel like it's automatically dated. However this piece is modern and elegant. I paired this with a blue upholstered bed and it's gorgeous. Glamorous and warm at the same time. The dresser is pretty. It came super fast and was a great price. The only thing I don’t like is that it takes a long time to put together, and the inside of the drawers are white. "Do you know when this item will be back in stock? " "I may want to replace the drawer pulls. 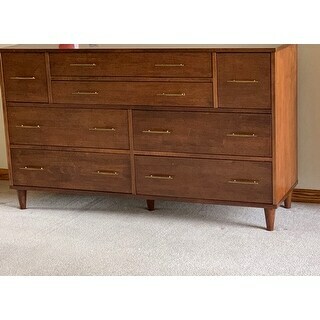 How far apart are the holes for the drawer pulls/handles? It is the same distance for all drawers?" "Does the finish on this piece match the finish on the Tessuto night stand?" 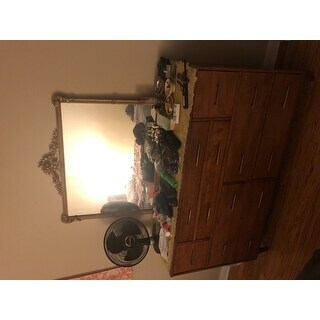 I'm not able to find information regarding the Tessuto night stand you mention, however ITEM# 16003617 is the coordinating night stand for this dresser. "When is this expected to come back in stock? " "Is the Jasper Laine Vilas Tobacco Bed the same color as Jasper Laine Ana Oak Dresser?" "For the two thing middle upper drawers, is the dimension measurement the total space of the drawers, or just the height of the inner edge of the drawers? For instance, I'm wondering if the measurement of 2.1" high is the total amount of height in the drawer, or if there's additional height between where the inner side edges of the drawer end and the top of the drawer?" style, number of drawers, classic.